I would be lost without the sat-nav on my smartphone. 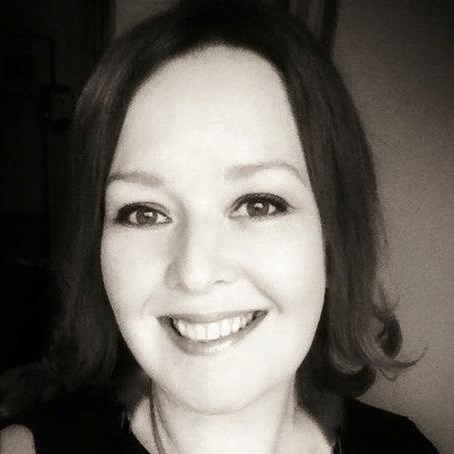 It has successfully guided me to and helped me find the locations of many of the restaurants that I have reviewed around Ireland for The Taste. However on my recent trip to Portarlington I came close to hurling my phone out of the car window in a fit of rage as the automated female voice became increasingly insistent that I turn left into a narrow pedestrian walkway after which I would ‘arrive at my destination’! 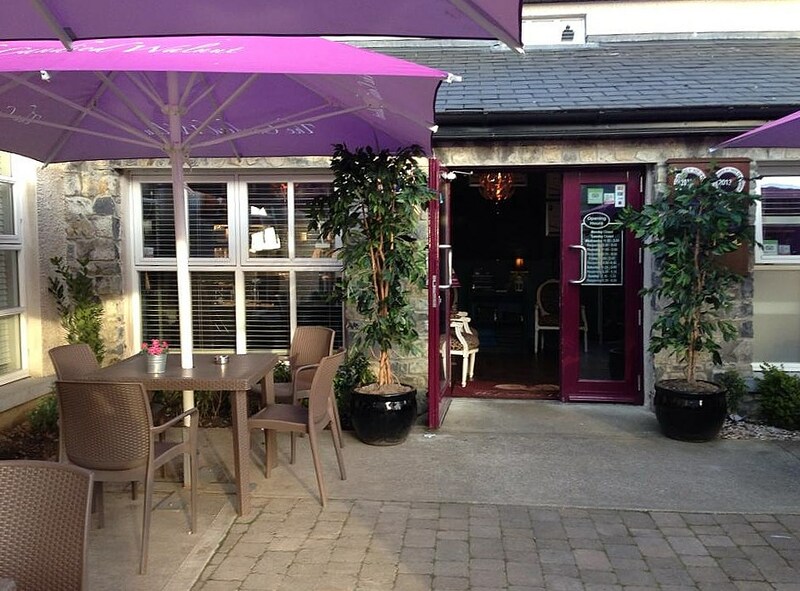 The aim of my visit to the County Laois town was to dine in The Candied Walnut a popular local restaurant that had been recommended to me. Unconvinced that it was located down the laneway, I decided to park my car and take a little wander on foot… and guess what? There it was – tucked behind a modern apartment block. Relieved to have found it, I was still at a loss to understand how I was expected to drive down to it! I had arranged to meet my friend Tim, a food blogger for dinner and was delighted to see that he had just arrived and was waiting for me outside the restaurant. It was busy on the Wednesday evening that we visited but this was due to the fact that the main ground-floor dining room had been booked for a large group attending a medical conference. We were greeted warmly and instead led up to our table in the small and cosy upstairs dining room. During the week a set dinner menu is offered but an à la carte menu is available at weekends. 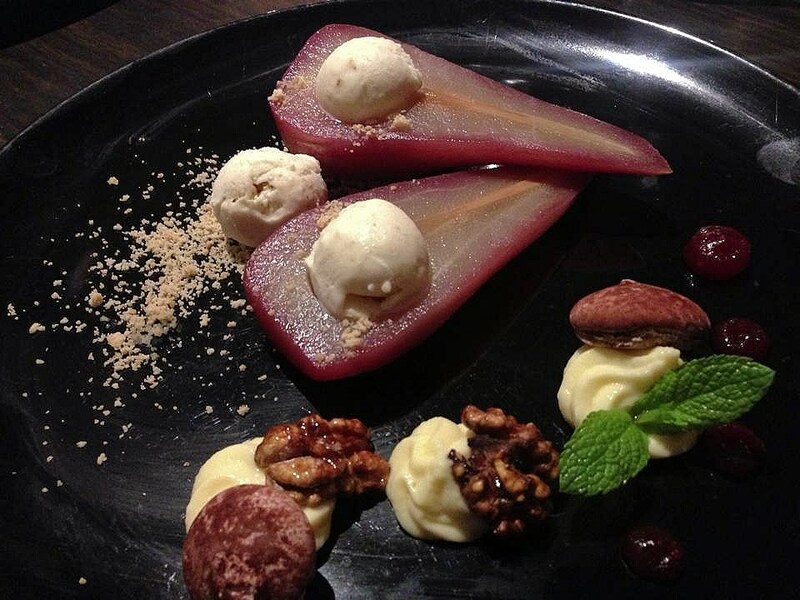 The Candied Walnut is also renowned for its Sunday Lunch offering. Priced at an unbelievable €21 per person for 2 courses or €25 per person for 3 courses, the set menu includes a nice range of dishes and we had no difficulty deciding what to order. 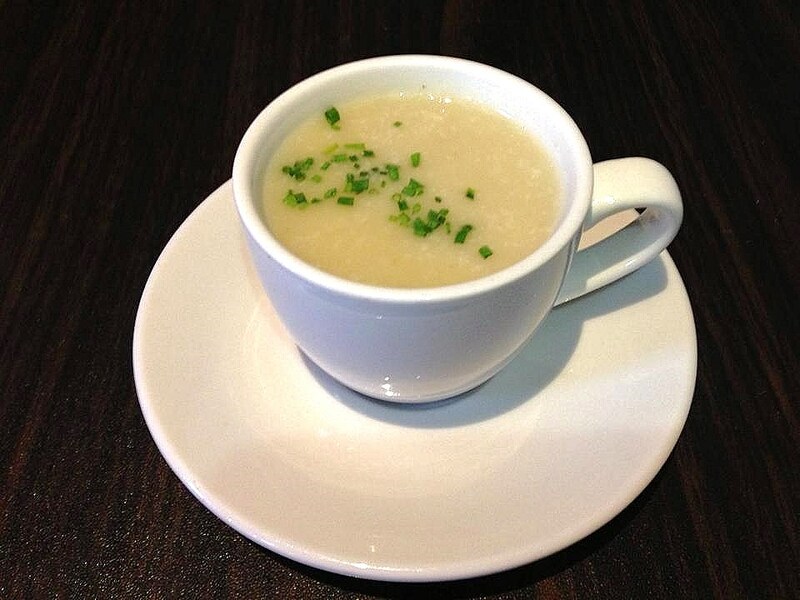 First up was a surprise pre-starter of Celeriac Soup which came presented in an espresso cup. Chopped chives were strewn on the surface and added a gentle onion flavour to the well-made, nicely creamy soup and we both enjoyed it. My starter of Hot & Spicy Chicken Wings, Celery Batons, Blue Cheese Dip looked like fairly standard fare at first but after taking a few bites I realised how good they were. The hot & spicy coating was as advertised but also possessed a complexity of flavour that you don’t often find. I loved how an initial sweetness gave way to spicy heat that complemented rather than engulfed the subtle flavour of the succulent chicken meat. 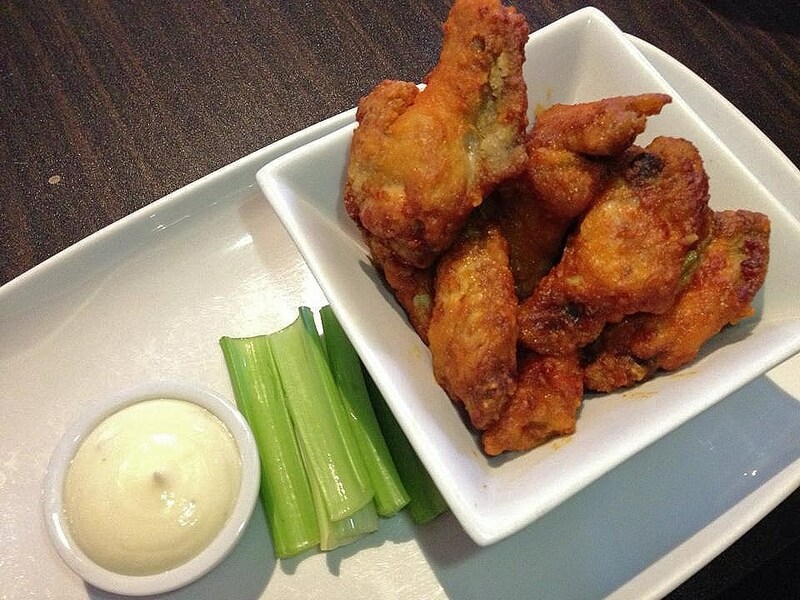 I happily gnawed away at the wings, picking as much meat off them as I could. The accompanying blue cheese dip was extremely tasty but I would have preferred a slightly rougher texture with some small nuggets of cheese still visible. 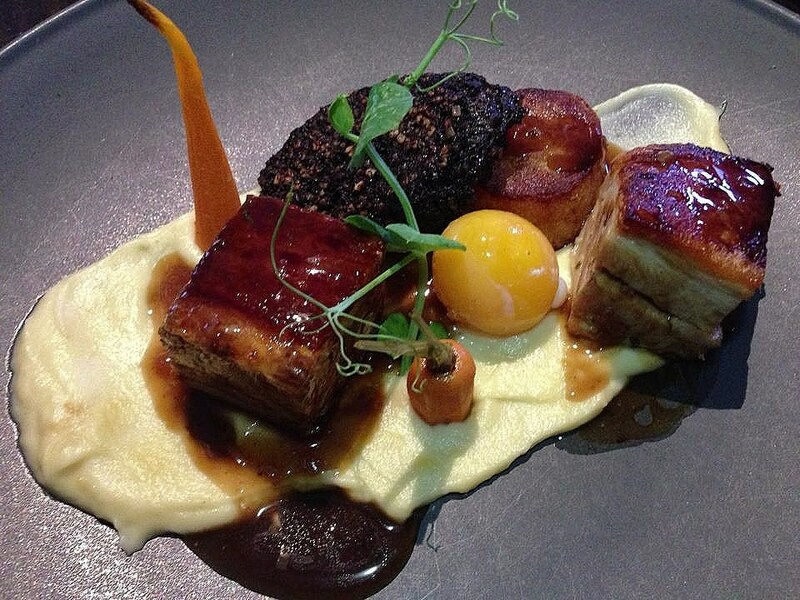 Tim’s Slow-Cooked Pork Belly, 60° Egg yolk, Clonakilty Black Pudding was a beautifully presented and skillfully cooked dish. Generous-sized cubes of soft slow-cooked pork belly were presented alongside spicy full flavoured black pudding and a buttery soft potato fondant. Unlike many other black puddings which are made using pork, Clonakilty uses beef along with oatmeal, beef blood and spices that results in a rich, textured pudding which was perfect with the pork. The sauce created by the egg yolk when pierced and a silky smooth celeriac purée accented the rich meatiness of this excellent dish. My main course of Pan-Fried Cod, Pea Purée, Fondant Potato, Beurre Blanc was another nicely presented and well-seasoned dish, comprising a large piece of well cooked cod served on a bed of peppery wilted spinach and a pea purée. Whilst the purée could have been a touch smoother it was full of the wonderful sweet flavour of the peas and worked well with meaty cod and the fabulous beurre blanc. Tim’s Wild Mushroom, Truffle Oil & Pine Nut Risotto, Rocket Leaves, Aged Parmesan Cheese, Panko Egg was a substantial but attractive looking dish with amazing depth of flavour. I’m not usually a huge fan of truffle oil as it can dominate. Here it had been applied with restraint and successfully managed to accentuate the flavour of the wild mushrooms without taking over. 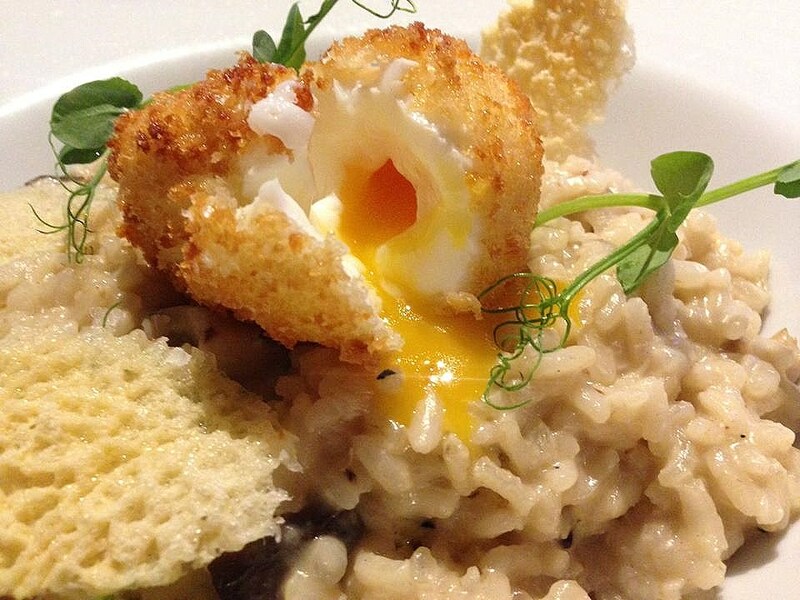 The dish was finished with some crispy parmesan wafers that added textural contrast and a deep-fried breadcrumbed egg which sat imperiously on top of the risotto, releasing its saucy centre when pierced with a knife. Whilst we enjoyed the wonderful flavours of the risotto, we both felt that it could have had a slightly looser texture. Poached pears can be tricky to get right but my dessert of Poached Pear, Red Wine Syrup, Hazelnut Ice Cream was an absolute joy to eat. Two perfectly poached pear halves sat side by side on the plate and looked absolutely beautiful with a pale pink colour from the red wine syrup they had been poached in. Simply topped with small scoops of a well flavoured hazelnut ice cream with some candied walnuts on the side, this dish was a perfect example of how less is often more. I loved it. 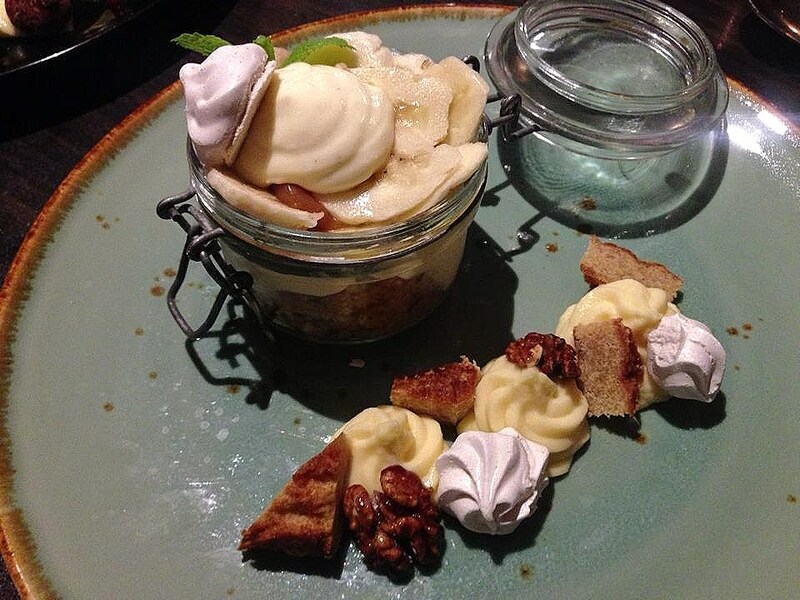 Tim’s Banana Cheesecake, Ginger Biscuit was presented as a layered dessert in a small Kilner jar. A ginger biscuit crumb base sat under a cheesecake cream and some salted caramel. Finally the cheesecake was topped with some freshly sliced bananas with some crunchy candied walnuts on the side. This was a dessert with broad appeal which aimed to please and this it succeeded in doing. Service throughout the meal was outstanding and delivered enthusiastically. We both had a real sense that staff deeply cared that we enjoyed the whole experience and we did. The Candied Walnut under Chef/Proprietor Barry Hayden is producing some extremely tasty food and for the price we paid represents astonishing value for money. We both left with full bellies and a feeling that all was right with the world.